I'm more excited than I thought I would be to post a vegan recipe, but this one was pretty damn tasty. It was born more out of laziness than anything else; I actually had it in mind to make a meat stuffed eggplant dish. Well, four o'clock rolled around and I realized I had no desire to start something I couldn't finish before I lost my sun light for the evening (food photographer problems!) So I revised my game plan and came up with something way more interesting and healthier than my original idea would have been. All win. I wish I had a compelling background story to sell this as a vegetarian creation I've been brainstorming for ages, but nope. Just something casual and delicious that I came up with last night and was easy enough to create in my first shot. Don't be intimidated by the ingredients, as this dish is easily adaptable to other flavor profiles. 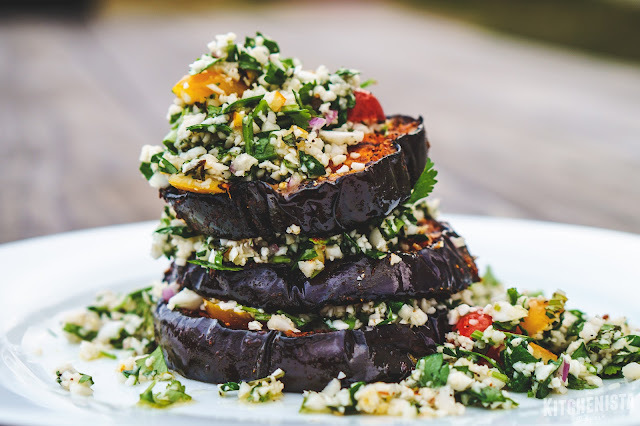 You're going to grill some seasoned eggplant slices and prepare a fresh salad with shredded cauliflower and herbs on the side. Easy stuff. The inspiration here was pretty straightforward. 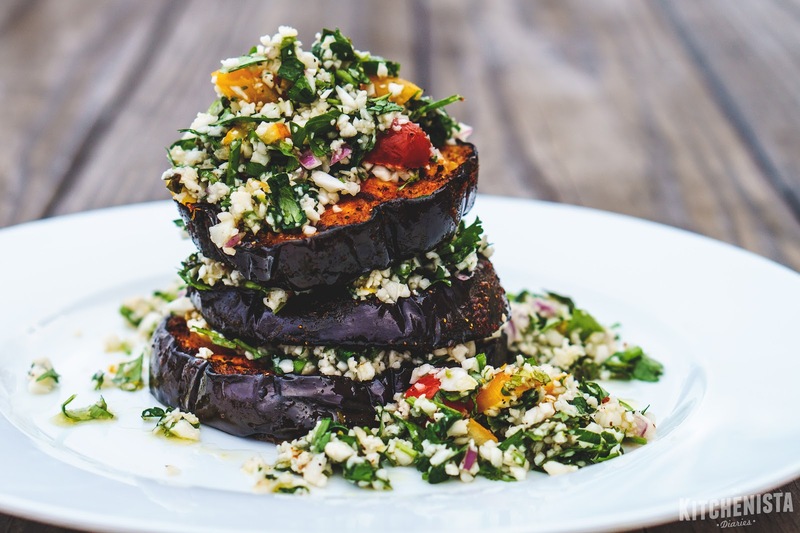 I love eggplant just about any way you can cook it. 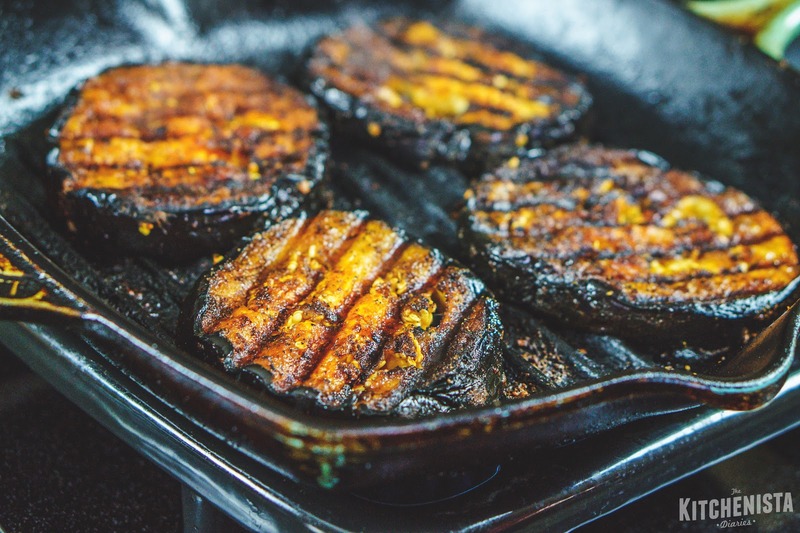 But I especially love thick slices of grilled eggplant, charred on the outside and silky tender inside. Eggplant takes especially well to robust seasonings like Moroccan rubs, curry powders and Mexican blends. My taste buds were in the mood for smoked paprika with a touch of cumin, coriander, ginger and turmeric. 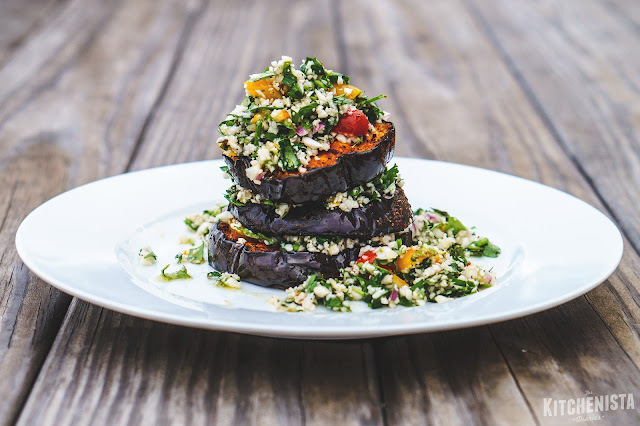 I wanted to balance the deep smoky flavors of my roasted eggplant with something fresh and light, so I thought of the Lebanese herb salad, tabbouleh. 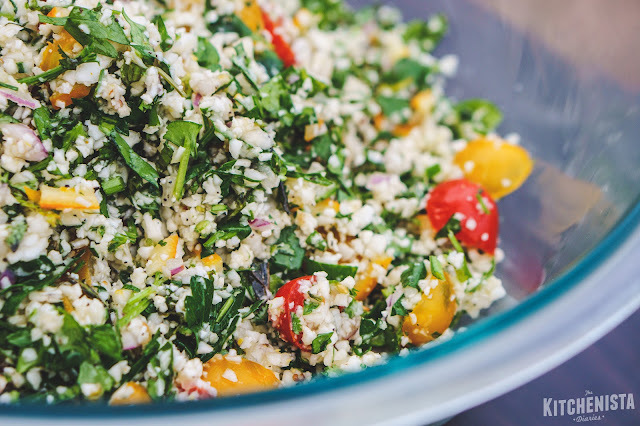 It's traditionally made with tons of fresh parsley, mint, onions, tomatoes, olive oil, lemon juice, and bulgur (or couscous.) I'm still on my Whole 30 plan though, so whatever I was making needed to be grain free. I've played around with cauliflower "rice" or "couscous" in other dishes before and had a head of cauliflower that needed to be used up. Bingo. 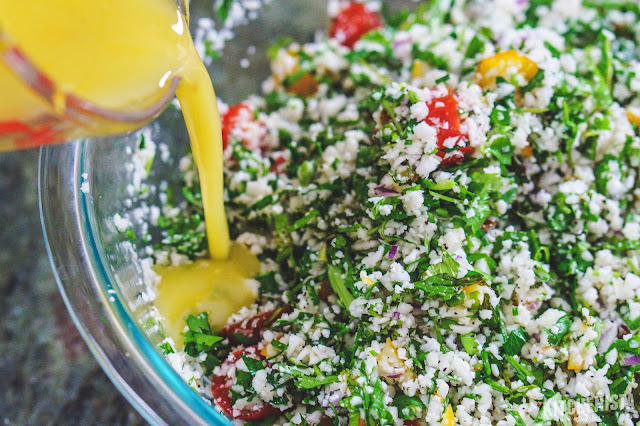 Once I took creative license and swapped out the grains for a vegetable, I continued to make more tweaks until ending up with something that isn't at all tabbouleh, but still very delicious and bright. Preserved lemons, jalapeno, chives and cilantro got added to the mix. I didn't cook the shredded cauliflower at all, to maintain more of a bite. It was easy, perfect, and leftovers tasted even better the next day after marinating in the fridge. In fact, I'll be adding this salad to my regular rotation all on its own. I have never loved cauliflower this much, not even roasted. It's pretty good. So, that's the dish in a nutshell. 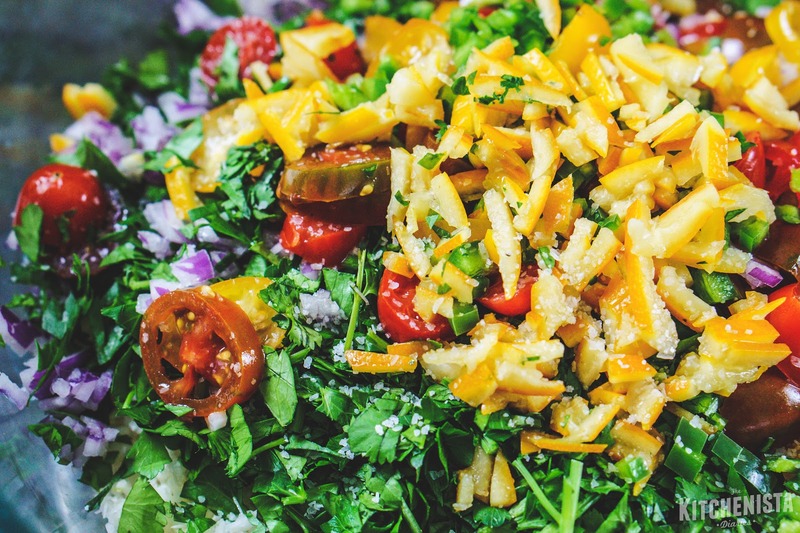 It would make a great lunch or a vegetarian dinner on the lighter side, but of course you can fill up on this salad to your heart's content. All vegetable and no sugar makes it about as close to guilt free as it gets. My kids happily cleaned their plates and asked for more! For those of you who remember your 2016 #FoodResolution, this dish covers a ton of bases. I hope you are as thrilled as I was to try something fresh, meatless and healthy! If you don't have a grill to use for this recipe, roast the eggplant slices on a lined heavy sheet pan. 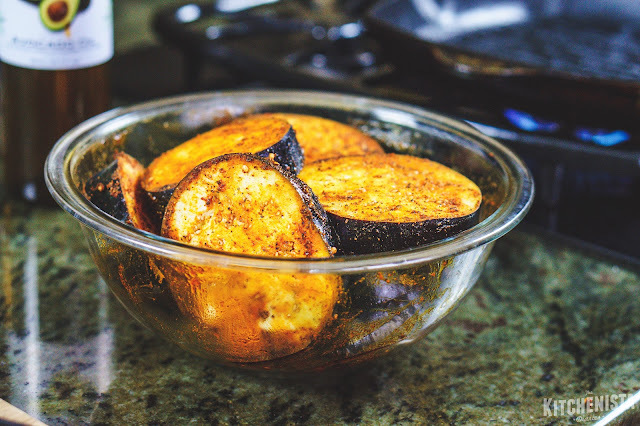 You can heat the oven to 400°F; roast about 20 minutes, flip the eggplant and continue cooking until golden for another 20 minutes. It won't be as charred as my preparation, but you'll still get some of the smokiness from the spices and smoked sea salt. Cut the eggplant into 1" thick rounds. In a large bowl, mix the 1/4 cup cooking oil with the smoked paprika, ras el hanout spices and smoked sea salt. 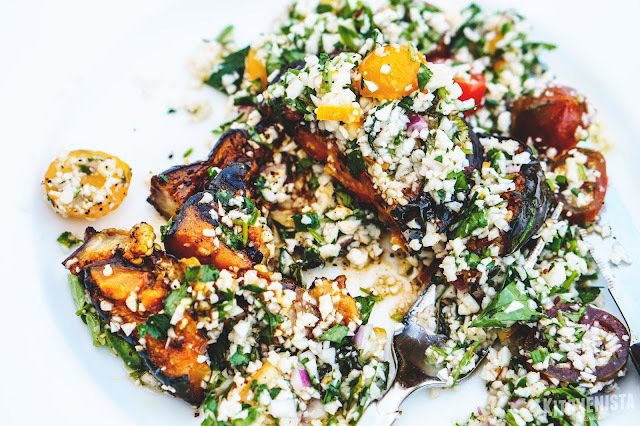 Toss the eggplant slices in the marinade, coating all sides. 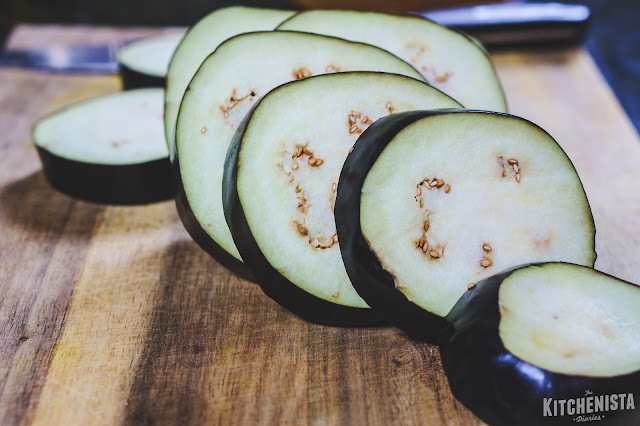 It's easiest to just use your hands and work quickly because eggplant absorbs oil very fast. 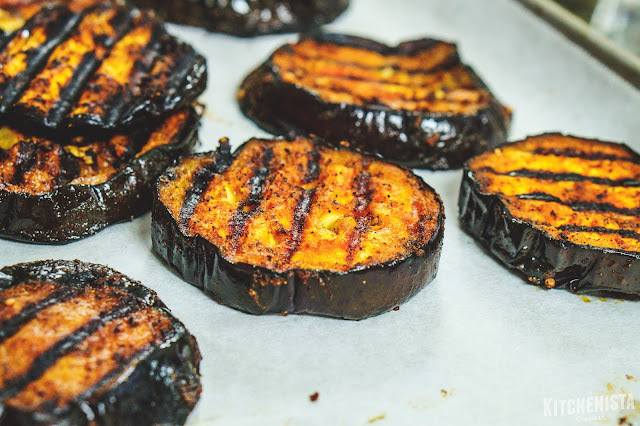 Let the eggplant hang out while you preheat your grill. When the grill is just shy of smoking, coat the grates with cooking oil and arrange as many slices that will fit at once. I had to work in batches. 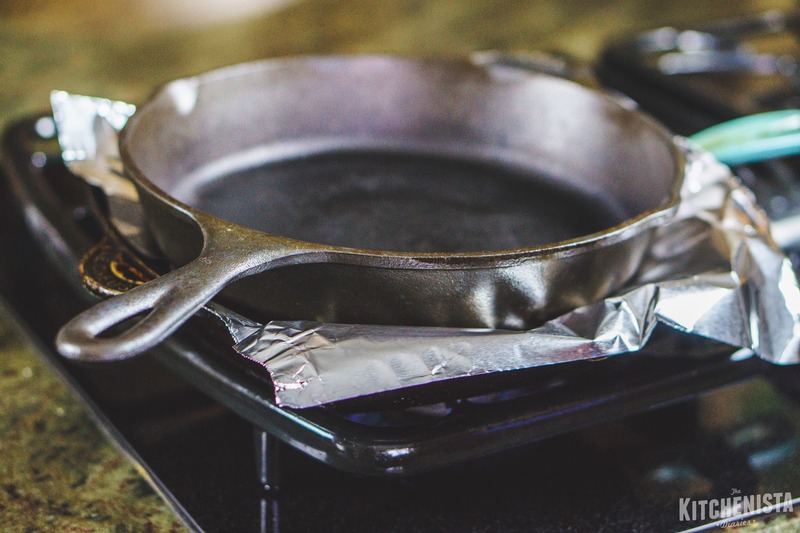 To speed up the cooking and get better grill marks, I covered the eggplant with a sheet of foil and weighed it down with another skillet. After five minutes or so, the slices were charred and crusty on one side and ready to be flipped. I didn't weigh them down, instead just let the eggplant continue grilling until tender all the way through. The grilled eggplant was transferred to a baking sheet to cool as I proceeded with the remaining batches. Meanwhile I prepared the salad. 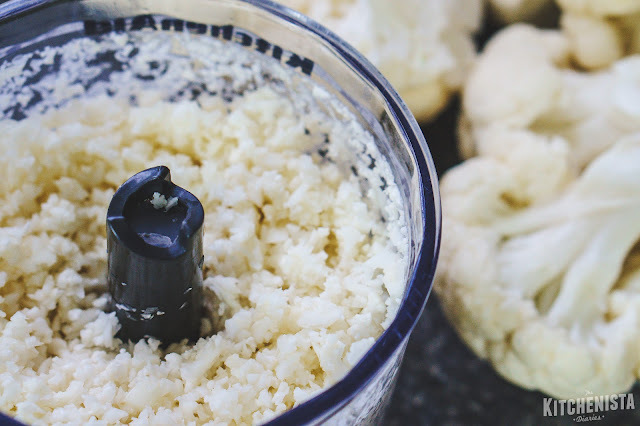 Break the cauliflower up into florets and pulse in the food processor until it resembles coarse crumbs. Transfer to a large bowl. Combine the diced tomatoes, onions and jalapeno. Toss with a little salt and let it hang out while you prepare the rest of the ingredients. The herbs should be washed and dried if not already done. 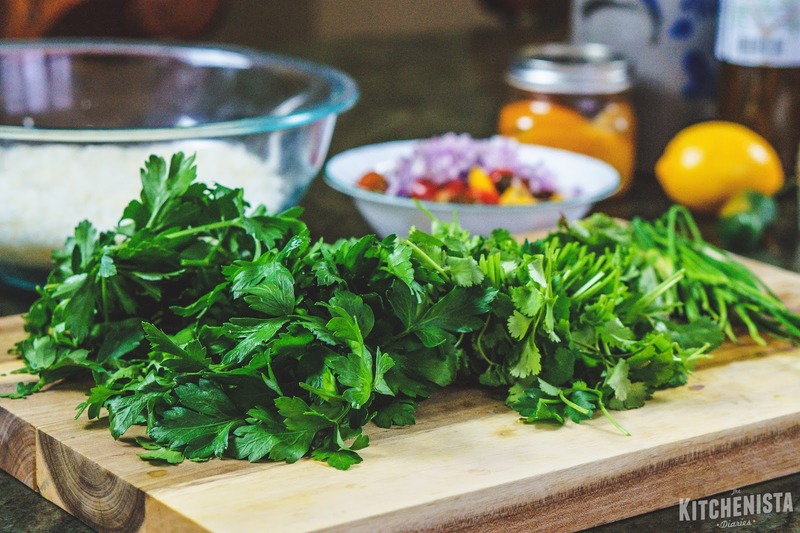 A salad spinner is great for prepping herbs! Treat them like you would lettuce or greens; you wouldn't want to eat a mouthful of gritty leaves. Roughly chop the parsley, mint, cilantro and chives. Toss with the shredded cauliflower, tomatoes, onion, jalapeno and preserved lemon. If you don't have preserved lemons on hand, no worries, but check my previous post on how to make them so you're prepared next time! 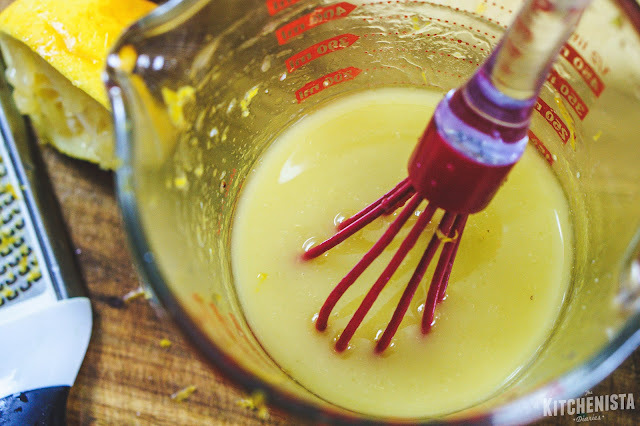 To prepare the vinaigrette, whisk together the dijon mustard, olive oil, apple cider vinegar, lemon zest and lemon juice. Taste and add salt and pepper as needed. 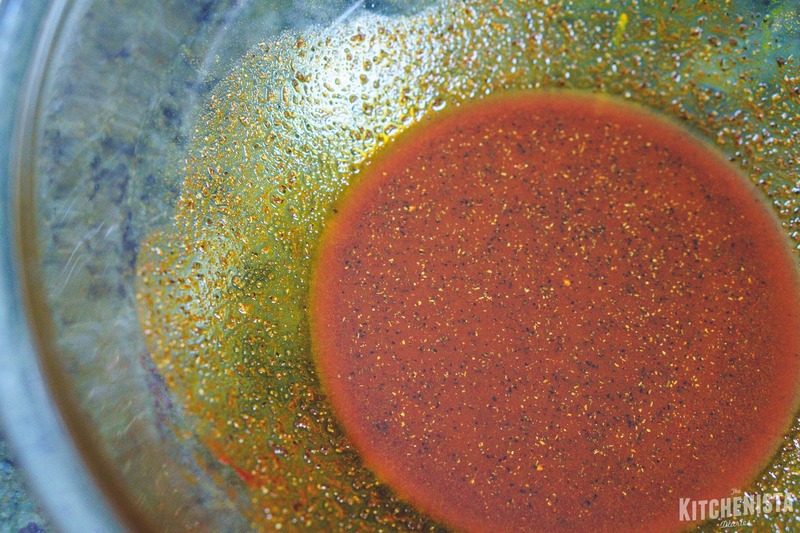 Pour the vinaigrette around the edge of the bowl, then toss the salad ingredients to coat. Season to taste with salt and pepper. 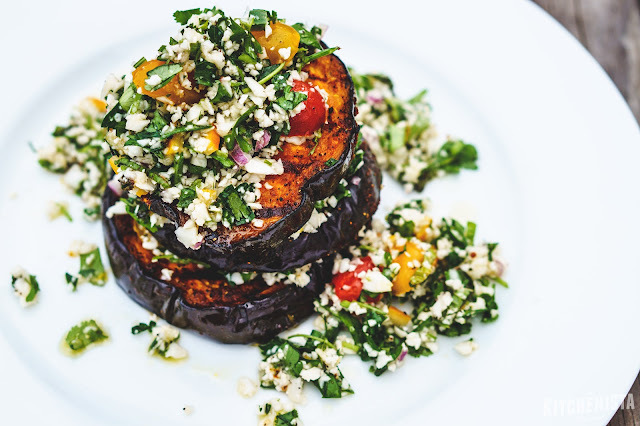 To serve as pictured, place the largest eggplant slice on the plate followed by some of the cauliflower salad. Continue stacking and layering eggplant slices with salad, using the smaller slices of eggplant as you get higher. Grab a fork and knife, then dig in! Leftovers keep well in the fridge and can be eaten cold or at room temperature.